No One Should Be Able To Say “We Did Not Know”! Please copy the dark brown text and add your signature at the bottom and send it to the list in blue. Many thanks to Jullitte Gillbert. 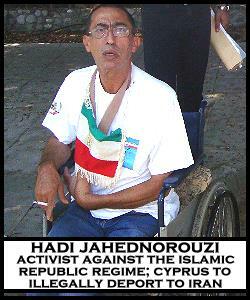 The wheelchair bound anti Iranian Regime activist seeking Refugee status in Cyprus, who is on the verge of imminent and illegal deportation by the government of Cyprus today. As such, the planned deportation of Hadi Jahednorouzis refugee case (ARC: 5395940) By the Cypriot government is a criminal act against a vulnerable individual whose life is at mortal risk if he is forcibly returned to Iran. Mr Hadi Jahednorouzi (ARC: 5395940) Is the Iranian asylum seeker who has already been arrested on 3 sperate occasions by the Islamic Republic of Irans government in connection to his anti-regime political actions. On his escape from Iran after fleeing in fear of his life, Mr Jahednorouzi has been visibly active as an Anti IRI activist. The anti IRI activities of Asylum seeking individuals such as Mr Jahednorouzi are heavily monitored by the Iranian government, as is a well know published fact . And as such  Mr Jahednorouzis return to Iran by the Government of Cyprus will facilitate Mr Jahednorouzis imprisonment, possible torture and almost inevitably his eventual death at the hands of the Iranian Regime. Mr Jahednorouzi’s lawyer has stated that there are crucial pieces of documented evidence, which were not acknowledged or taken into account in Mr Jahednorouzi’s application for asylum. The world is watching Mr Jahednorouzi’s illegal deportation case very closely, especially as Cyprus has been involved in very recent deportations of Iranian asylum seekers that were both illegal and deeply disturbing from the point of view of basic human rights and safely. Eliza Savvidou Commissioner for Administration (Ombudsman) has also recently issued a response of acknowledgement to concerned citizens of the world, in regard to the terrible abuses that have been proven to of taken place recently for Iranian asylum seekers at the hands of police in Larnaca. « Mr. Billström! Mitra Stays… and the Islamic Regime Goes! Sverige måste stoppa utvisningen !